Astrology is often dismissed as being a pseudo-science, but when Mercury goes Retrograde even skeptics might feel the pull of the planets. Mercury goes retrograde for three weeks at a time, four times a year, during which it appears to be moving backward in the sky. According to astrology, Mercury is the designated ruler of communication, technology and travel and while the reversed movement is just an optical illusion, some believe it impacts our day to day. So the past few weeks might’ve felt like a string of bad luck, or a series of coincidences but it might have been Mercury retrograde. With the most recent retrograde just wrapping up, how did it effect you this past month? 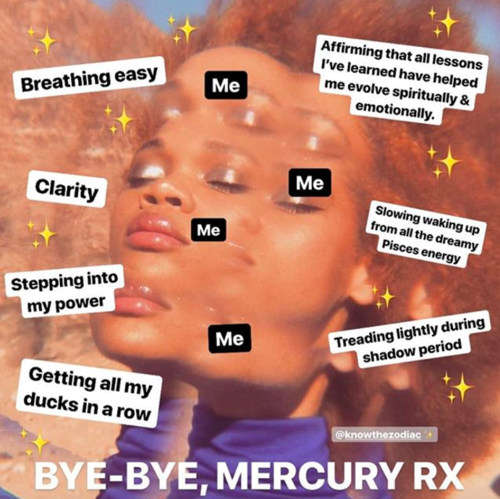 Here’s five things that happened to us (or others we know) this Mercury retrograde. Whether it was out with the old or in with the new, we saw far too many relationship changes this retrograde. Your current relationship might feel more difficult than ever, or you might see an old flame resurface… Whatever it may be, don’t make any rash decisions, it might just be the retrograde. My computer wouldn’t stop telling me to update, and my phone was constantly out of battery. We had not one, not two but THREE power outages in the space of three weeks. Was it a ghost who switched off our power switches, or was it Mercury retrograde? Don’t be offended if dates bailed, or your friends couldn’t find the time to hang out. Last minute cancellations are Mercury retrogrades thing. We couldn’t seem to sync up our calendars with anyone, from our family to our dentist. We missed more trams than we care to admit the past few weeks, and PTV had the audacity to cancel trains on the first day of a new job. Others we know found themselves in traffic for hours, and had multiple close calls on the road. Moral of the story, prepare for inevitable delays during the next retrograde. Maybe you tried to pitch an idea to your boss at work and it backfired dramatically, or tried to poke fun at your partner only to have them take it to heart. You might have thought your communication lines were open, but maybe Mercury was interrupting all the signals. We know we did. But as the dust settles from the movement of the planets, feel free to hash out things that might have gotten lost in translation while the stars weren’t aligned. Luckily, we have bit of time before the next retrograde rears it’s head on July 8 to torture us until August 1.